In a new case of censorship in Italy, the State Council has blocked a campaign by the Italian Union of Rationalist Atheists and Agnostics (UAAR). The campaign used the slogan «Don’t leave it to chance», encouraging service users to check in advance that their doctors were not opted-out of providing legal services which they might want to use in future. Though they previously won an appeal against censorship by provincial authorities, the State Council has now overturned that previous ruling, on the grounds that the UAAR campaign was «offensive to the ethical and religious choices of the doctors who practice a conscientious objection». 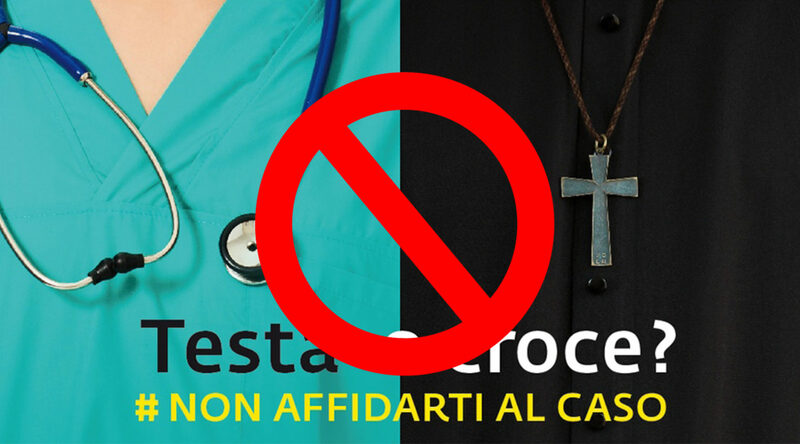 In October 2018, the Italian Union of Rationalist Atheist and Agnostics (UAAR) launched an awareness campaign highlighting the unpredictable use of opt-outs by doctors from certain medical procedures. UAAR is one of Humanists International member organizations in Italy. The campaign, called «Don’t leave it to chance» (#NonAffidartiAlCaso), invited people to ask their doctors upfront for their position on abortion, assisted dying, etc., to avoid finding later – and maybe too late – that they couldn’t get the treatment they might need. For example, the percentage of Italian doctors who exercise «conscientious objection» against performing abortion is enormous, with a peak of 97% of «medici obiettiori» in the region of Molise, where it is almost impossible for a woman to have an abortion in a public hospital, despite access to free and safe abortion being a right recognised by law 194 of 1978. In the region of Liguria, where Genoa is located, the opt-out percentage is above 60%. Back in January 2019, the municipality of Genoa blocked the UAAR campaign, claiming that it went against «the respect due to each religion». UAAR lodged an appeal, also pointing out the fact that the same Municipality, in name of freedom of expression, did allow a banner of an anti-abortion group called «Pro-Vita». 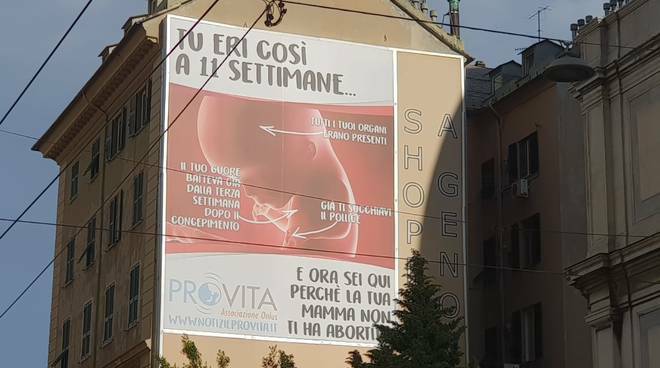 Pro-Vita’s banner showed a fetus and the sentence: «After 11 weeks you were like this. Now you are here because your mummy did not have an abortion». The Mayor of Genoa, Marco Bucci, defended the banner saying: «There is freedom of expression in Italy, so I don’t see why we should intervene in this case». UAAR eventually won in its appeal in March 2019. On that occasion, UAAR Secretary, Adele Orioli, commented: «We welcome this news with great satisfaction. This is an occasion to show once more our commitment to the defence of the rights of every male and female citizen». However, the Municipality of Genoa lodged a further appeal, which against all expectations has now been upheld by the Italian Council of State with an extraordinary judgement that the awareness campaign was «offensive» with regard to the choices of doctors who practice a conscientious objection. The campaign slogan uses a pun on the concept of flipping a coin. The Italian «Testa o Croce?» («Heads or Crosses») is equivalent to the English phrase «Heads or Tails» in regards to flipping a coin. It’s a message which conveys the unpredictability of whether a patient’s doctor will provide the services to which they are entitled. The full slogan was: «Testa o Croce? Non affidarti al caso» («Heads or Cross? Don’t leave it to chance»). According to the new judgement, the pun «implicitly suggests that Christian faith (symbolised in the pun by the term «Cross») obscures reason (symbolised in the pun by the term «Head»)», and therefore impugns the rationality of the choice of Christian doctors in exercising conscientious objection. UAAR Secretary, Adele Orioli, commented: «This freedom-destroying ruling goes way beyond our most pessimistic expectations. […] We are ready to bring this case to the European Court of Human Rights in Strasbourg». 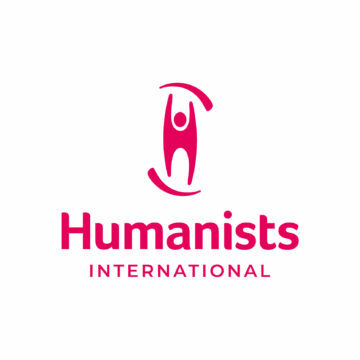 Humanists International chief executive, Gary McLelland, said: «We stand behind our members the Union of Rationalist Atheists and Agnostics in presenting this campaign, the clear aim of which campaign is to help patients get the services they are entitled to, and not to ‘leave it to chance’. «There is nothing deeply offensive about the idea that – from a patient’s perspective – a doctor who obliges the patient’s rational and personal choice may well be preferable to one who blocks access to services on the basis of their own religious convictions. If some doctors feel ashamed that their choices are being highlighted, then that should prompt them to think again about those choices, and either way it is not a matter on which the state should intervene to block one side of the debate.